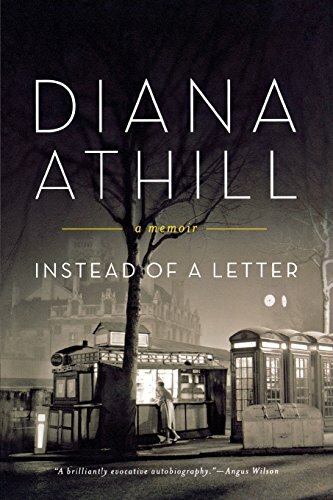 As a young woman, Diana Athill was engaged to an air force pilot. Instead of a Letter tells how he broke off the engagement, married someone else, and, worst of all, died overseas before she could confront or forgive him. Evoking perfectly the picturesque country setting of her youth, this fearless and profoundly honest story of love and modern womanhood marks the beginning of Athill's brilliant literary career. Terrific, real memoir of heartbreak. Reads like a smart coming-of-age story. Diana Athill grew up expecting to have a conventional life for a woman of her time: she’d get married, have children, and live happily ever after. That was how things worked when you were a woman born in England in 1917 to an upper class family. But that sort of life would have made for an unsatisfactory memoir, and Instead of a Letter is anything but unsatisfactory. Compelling, appalling, illuminating and inspiring are the words to describe this elegant book, the first of Athill’s several memoirs. And yet, for a time, it looked like Athill would follow the accepted script for a twentieth century Englishwoman. Her childhood, while not idyllic, was privileged. She spent much of it at her maternal grandmother’s home, Beckton Manor in East Anglia, riding horses and reading books. She loved it dearly, and appreciated it even as a child: “I felt that I must measure every detail of it against the future, and I remember standing under the great beech tree by the lawn, trying to will some essence of myself into the still green air so that after I was dead my ghost would materialize there.” When she was thirteen years old, her parents finally admitted that they were living above their income, and moved into the Manor Farm – a consequence of being “poor” that came closer to being an advantage. Athill far preferred the Farm to living in Hertfordshire, where her father worked. While she occasionally caught wind of family problems, for the most part her existence as a child was carefree. "It was at school that my secret sin was first brought into the open: Laziness. I was considered a clever girl, but lazy. It has been with me ever since, and the guilt I feel about it assures me that it is a sin, not an inability. It takes the form of an immense weight of inertia at the prospect of any activity that does not positively attract me: a weight that can literally paralyse my moral sense…. I slide off sideways, almost unconsciously, into doing something else, which I like doing.... So often have I proved that this form of self-indulgence ends by making my life less agreeable rather than more so that my inability to control it almost frightens me; but that I should ever get the better of it now seems, alas, most unlikely." Lives there a procrastinator among us who does not have a shock of self-recognition upon reading that passage? Yet who among us could have been so brutally honest – even self-condemning – about this failing? And that is part of the magic of this memoir, that Athill is so unflinching in gazing upon herself. When Athill was fifteen, she met Paul, whom her parents had hired to tutor her brother. Athill was captivated by Paul, and dated him on and off even while seeing – and falling in love with – other men. But one failed romance led Athill to write to Paul in despair. Paul wrote back immediately, quoting Emerson: “When half-gods go/The gods arrive,” a comparison that made her laugh at his conceited. But that letter marked the end of the beginning for their relationship, and soon they were engaged. Athill was only eighteen and a student at Oxford, and she and Paul planned to marry only after she finished her studies. Paul had joined the military and been posted to Egypt, and they wrote and wrote and wrote to one another, planning their future. Then Hitler invaded Czechoslovakia, and Paul was transferred to Transjordan. And then, suddenly, abruptly, and completely, Paul’s letters stopped. Athill never heard from him again until she received a formal note, two years later, asking her to release him from their engagement because he was about to marry someone else. Athill writes eloquently of her feelings when Paul’s silence commenced, and how she continued to deal with them as the months crept by. She wrote him blunt, agonized letters, but still the silence continued. It was terrible, but Athill found herself unable to write him off as a lost cause, refusing to give up, knowing that when he returned to England their romance would resume. It is a despairing hope that every woman who has ever loved a man who has jilted her has known, but Athill captures it in words so completely that the reader is once again present in those feelings, no matter how far removed or how fulfilling her present state. At the time she wrote this book, several decades removed from the failed romance, Athill considered the loss of Paul to be the key event of her life, that which gave rise to everything that happened to her thereafter. She does not blame Paul so much as she gives him a power that no eighteen-year-old’s lover should have. Without the loss of Paul, Athill seems to believe might never have gone on to a series of doomed love affairs, often with married men; she might never have become an editor at a prestigious publishing house; she might never have become a traveler; she might have found another man and followed through on her original life plan. "It is broken by a small promontory within it, and goes from navy blue near the open sea, through every shade of aquamarine, with depths of pure emerald under its cliffs and chunky emerald patches where a boat throws a shadow. Its depth and the nature of its sandy bottom combine in a ratio perfect for transparency, sparkle and movement – I have never seen it when it was not netted with light…. Beyond that, cliffs … above the cliffs steep, olive-fleeced, cypress-punctuated mountainside, rising to an abrupt escarpment with a sheer rock-face which turns apricot-coloured in the evening sun and is rimmed by the rapid, stumbling line of the mountain’s profile, plunging out and round to one’s right to hit the sea on the far side of the bay. "All this is bathed in light and silence….I once spent four hours alone on that terrace with an unread book and untouched writing-pad, turned by the spectacle into nothing but eyes, with no idea of the time that was passing until the sun went down." I could quote beautiful passages to you for many times the length of this review; I turned down many pages in this book as reminders to myself to reread and fully relish the language. It is not flowery or overwrought; it is precise and descriptive and perfect to the moment described. Whether Athill is describing scenery, as in this passage, or her emotions, as in the chapters dealing with Paul, or her career and work habits, it is all beautifully written. Among many other things, Instead of a Letter vividly describes the end of a relationship and the sense of loss that can drain away all pleasure from life for a long time afterwards. Diana Athill was editor to many famous writers, including one of my favourites, Jean Rhys, and is also the author of several other memoirs (I also like Stet, her memoir about her publishing career, particularly the section describing how she worked with Jean Rhys and helped her to finish and publish Wide Sargasso Sea). Instead of a Letter, though, is about her happy childhood and the sad ending of her engagement, and how she eventually found meaning in her life.